An oops is a deviation from correct behavior of the Linux kernel which produces a certain error log. The better-known kernel panic condition results from many kinds of oops, but others may allow continued operation with compromised reliability. The term does not stand for anything, other than that it is a simple mistake. When the kernel detects a problem, it prints an oops message and kills any offending process. The message is used by Linux kernel engineers to debug the condition which created the oops and fix the programming error which caused it. The official Linux Kernel documentation regarding oops messages is in the file Documentation/oops-tracing.txt of the kernel sources. Some logger configurations may affect the ability to collect oops messages. Once a system has experienced an oops, some internal resources may no longer be in service. Even if the system appears to work correctly, undesirable side effects may have resulted from the active task being killed. A kernel oops often leads on to a kernel panic once the system attempts to use resources which have been lost. Kerneloops also refers to a software to collect and submit kernel oopses to the kerneloops website. Kerneloops.org provides statistics of oopses. 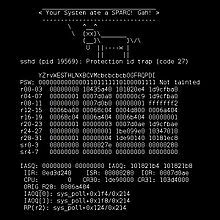 Linux kernel oops on SPARC. with a dead ASCII cow.